Since ancient times, the seemingly endless grains of sand have provided to the human mind the most immediate model of the vast, the countless or even the infinite. Many examples can be found in the Bible, where the “countless sand” several times describes the thoughts of God, the great abundance of grain or the promised descendants of the future. Even in as early texts as the so called “Great Harris Papyrus” (ca 1200 B.C. ), found in a tomb near the ancient Egyptian city of Luxor, king Ramses III is mentioned as having created paradise-like gardens with “walks shaded by all kinds of sweet fruit trees laden with their fruit; a sacred way, splendid with flowers from all countries, with lotus and papyrus, countless as the sand”. The endless sand parable permeates cultures and epochs through tradition and literature: in Shakespeare’s play “Richard II” (ca 1595), the Duke’s of York attempt to “beat back Bolingbroke” in battle is commented upon as “numbering sands and drinking oceans dry”. In Henrik Ibsen’s play “Ghosts” (1881), Helene Alving says that “this country is haunted by ghosts – countless as grains of sand”. And in Jorge Luis Borges’ short story “The Book of Sand” (1975), a magic book’s seemingly infinite, disordered multitude of pages is compared to the countless grains of sand, having no beginning and no end. Though Shakespeare refers to counting of the sand as a synonym to the impossible, there has been at least one attempt to count the seemingly countless: scientific minds cannot possibly be content with such vague expressions as “countless” or “immeasurable”, especially when these in fact constitute a concealed acknowledgment of inability. Archimedes of Syracuse (ca 287 – 212 B.C. ), the ancient Greek scientist and inventor and one of the greatest geniuses of all time, carried out the task of determining a possible upper bound of the number of grains of sand that could possibly completely fill the whole Universe, as this was understood in his time. In his short work “Psammites”, known as “The sand reckoner” in English, not only did he provide an ingenious method of calculation, but he also invented a system of expressing and visualizing extremely large numbers. Moreover, he taught the laying out of scientific ideas in a concise and clear manner in what might well be the first scientific paper in history. 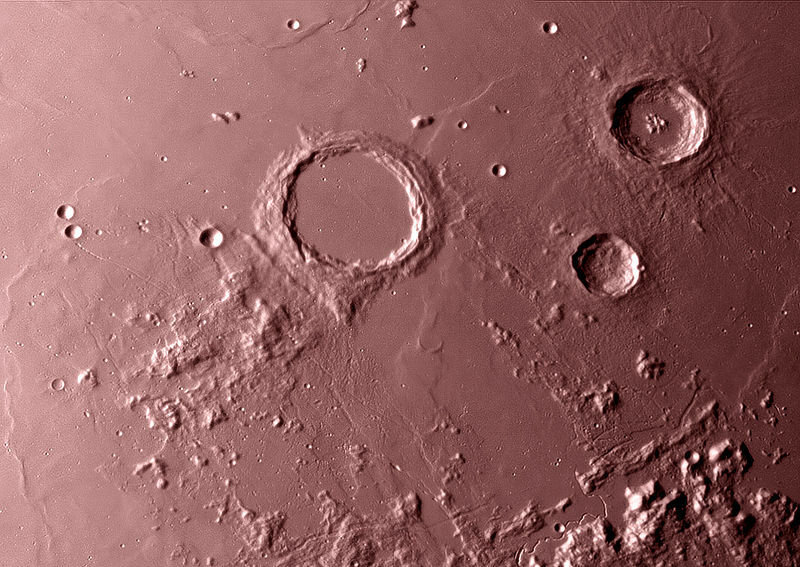 Archimedes and sand: The lunar crater dedicated to the great scientist of antiquity is the largest in this picture. In his introduction, addressed to king Gelon II of Syracuse, a paragraph strongly reminiscent of the abstracts of modern scientific literature, Archimedes makes a synopsis of the basic thesis of the work, namely that a) sand is not infinite nor countless, b) sand grains can be counted using a numbering system of his own invention and c) numbers produced by his system can vastly exceed the number of grains of a mass of sand that fills the whole Universe. In laying out his proof, he makes use of the then state-of-the-art theories of the Greek astronomer Aristarchus of Samos (310 – 230 B.C.) whose qualitatively exact heliocentric model is rather unthankfully identified today as Copernican. In “Psammites” Archimedes makes a reference to a now lost work of Aristarchus: “…Aristarchus of Samos brought out a book consisting of some hypotheses, in which the premises lead to the result that the Universe is many times greater than that now so called. His hypotheses are that the fixed stars and the Sun remain unmoved, that the Earth revolves about the Sun in the circumference of a circle, the Sun lying in the middle of the orbit, and that the sphere of the fixed stars, situated about the same centre as the Sun, is so great that the circle in which he supposes the Earth to revolve bears such a proportion to the distance of the fixed stars as the centre of the sphere bears to its surface”. Aristarchus’ model, conceived more than two thousand years ago and more than 16 centuries before the invention of the first telescope, was correct in placing the Earth and planets in orbit around the Sun and displacing the fixed stars, qualitatively correctly, in a much greater distance, forming a vast sphere. The final, and largest, number mentioned in “Psammites” is B^A or 100000000^(100000000^100000000), a monster consisting of a 1 followed by 8*10^16 zeroes. Obviously, the Archimedean system, which bears strong similarities to the modern positional system, can be easily extended to produce even larger numbers. Having thus made sure that his number system is adequate in expressing extremely large numbers, Archimedes begins his sand reckoning by establishing a sequence of spheres the last of which coincides with Aristarchus’ Universe. This, described as a sphere reaching as far as the fixed stars, he considers to have a maximum diameter of one hundred myriad myriad myriad stadia, i.e. 10^14 stadia, a stadion being approximately equal to 185 meters. Therefore the Universe in “Psammites” is approximately 2 light years across, barely half the distance from the nearest star, Proxima Centauri. Though, compared to the 93 billion light years accepted today as diameter of the observable Universe, this appears as a huge underestimation, it brought for the first time the size of the cosmos to nearly unimaginable levels and in this respect it was a breakthrough. Indeed, 2 light years may appear meager, however the light year is a huge unit of measurement: Voyager 1, the space probe launched in 1977, after travelling for more than 33 years in space, has covered so far barely 15 light hours or 0,0018 light years. For his time, Archimedes’ calculation was carried out in a cosmic scale of unprecedented levels. Explaining his calculation, Archimedes several times points out that the volumes of two spheres “are related to each other as the cubes of their diameters”, i.e. that the ratio of their volumes is equal to the ratio of the cubes of their diameters. For example, a sphere with a diameter 5 times greater than the diameter of a smaller sphere has a volume 5^3=125 times greater than that of the smaller sphere. Curiously enough, the first sphere in Archimedes’s sequence is the poppy seed, which is assumed to be equivalent to the volume of at most 10000 grains of sand. The second sphere is one with a diameter a finger breadth, comparable to an ordinary marble. Assuming that the poppy seed has a diameter at least one fortieth of the finger breadth, the second sphere has a volume at most 40^3=64000 times greater than that of the first sphere and it can therefore contain 40^3*10000=640000000 grains of sand maximum. Expressed in Archimedes’ number system, this number is equal to six units of the second order of the first period increased by four thousand myriads of units of the first order of the first period. From here on Archimedes proceeds by establishing a sequence of diameters in geometric progression, increased each time hundredfold, yielding thus each time a volume 100^3 times greater than the previous one. Assuming that a myriad finger breadths are greater than one stadion, the ninth sphere, with a diameter of 100 myriad myriad stadia, has a volume no more than 10^42 times that of the second sphere and can contain 10^42*40^3*10000 grains of sand at most, a number smaller than one thousand units of the seventh order of the first period. The tenth and final sphere, the one coinciding to the sphere of the fixed stars, is assumed to have a diameter no more than a myriad times the diameter of the ninth sphere and it can therefore contain no more than 10000^3*10^42*40^3*10000=6,4*10^62 grains of sand. Archimedes concludes that “the number of grains of sand filling a sphere of the size that Aristarchus lends to the sphere of fixed stars is less than one thousand myriad myriad units of the eighth order of the first period”. Apart from the ingeniously set up numbering system and the equally ingenious calculations, of which only a small part is referred to here, Archimedes’ sphere sequence and step by step procedure also provides a method of actually visualizing his mind bending numbers. Each sphere between the third and the ninth is related to its previous one approximately the same way as a small ordinary marble is related to the sphere a standing man would exactly fit into. In order to proceed from one sphere to the next, one may visualize the current sphere shrinking to the size of a marble and another one with a diameter of a man’s height appearing next to it. The seventh sphere already has a diameter 25 times that of the Earth, more than two times greater than that of Jupiter, the largest planet in the solar system while the eighth sphere has a diameter almost 23 times that of the Sun. Though, as mentioned above, the now accepted diameter of the observable Universe is unimaginably greater than that accepted by Archimedes, it is quite remarkable that Archimedes’ number system is still quite applicable. Indeed, the 93 billion years diameter of the Universe corresponds to a sphere approximately 10^32 times bigger in volume than the tenth and last sphere in “Psammites”. This number corresponds to approximately 6,4X10^94 grains of sand or, in Archimedean terms, six hundred and forty myriad units of the twelfth order of the first period, which is barely scratching the surface of the immense number depths the system provides. In “Psammites”, the rather humble task of sand reckoning, synonymous to the impossible, is taken from the sands of “Syracuse and the rest of Sicily” or even “that which is found in every region inhabited or uninhabited” to a calculation of universal proportions. Archimedes related his huge numbers to the Universe itself and showed that nothing material can actually remain immeasurable or countless, an idea that today appears as self evident by scientists who are dedicated in counting and measuring nearly everything in the Universe, whether it is galaxies, stars or atoms. More than two thousand years after Archimedes, Carl Sagan (1934 – 1996), the famous astrophysicist and popularizer of science, first pointed out to a wider public the rather impressive and perhaps disturbing fact that the stars in the sky may be even more numerous than the grains of sand on Earth, counted using gigantic numbers in modern exponential notation. These, now called “astronomic” numbers, are those that historically began as “sand reckoning numbers”. Archimedes’ sand reckoning, once synonymous to the impossible is now a routine scientific pursuit, both in minuscule (when tiny particles of matter are studied) and gigantic scale (when the cosmos is studied). And inventing new names for gigantic numbers has never ceased, two recent and quite famous examples being the googol and the googolplex. Closing “Psammites”, Archimedes acknowledges that his numbers and results may appear incredible “among men who do not have experience in Mathematics”. “On the other hand”, he concludes, “those who know of such matters and have thought about the distances and sizes of the Earth, the Sun, the Moon and the Universe in its entirety, will accept them due to my argument and that is why, King Gelon, I believed you might enjoy having brought it to your attention”.